Fall color, calm water of Newton Lake. the fourth wilderness area to be created in the national system. 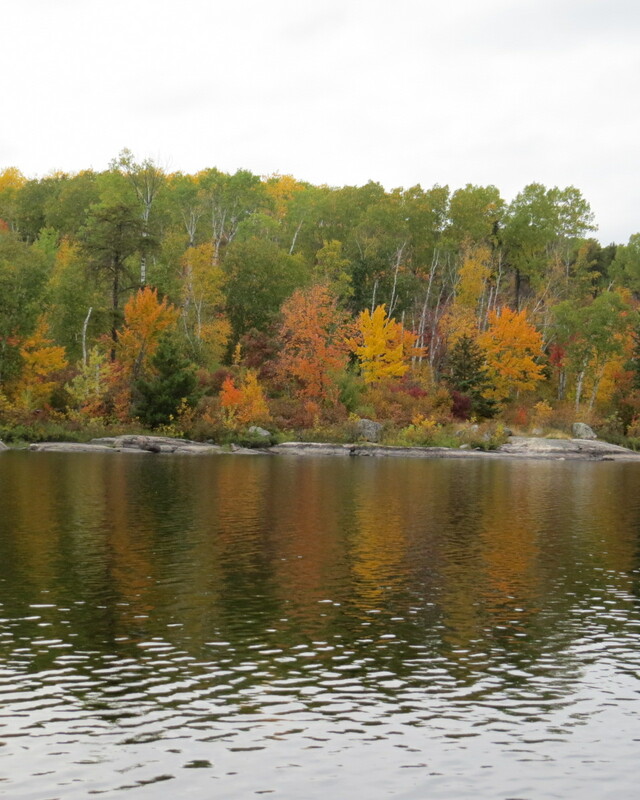 Fall and Newton Lakes were dead calm, and with only a slight wind present on Pipestone Bay on Basswood Lake, we made good progress, covering the distance in 4 1/2 hours. As we entered the final bay, we saw through binoculars something that looked like a tent. Hoping it wasn’t, we came closer, until I saw the clear movement of a tarp. We had scouted the site two years ago and had thought it a perfect place to camp. I did in fact camp there four nights last year, when I had to go alone, and it was better than I had thought. 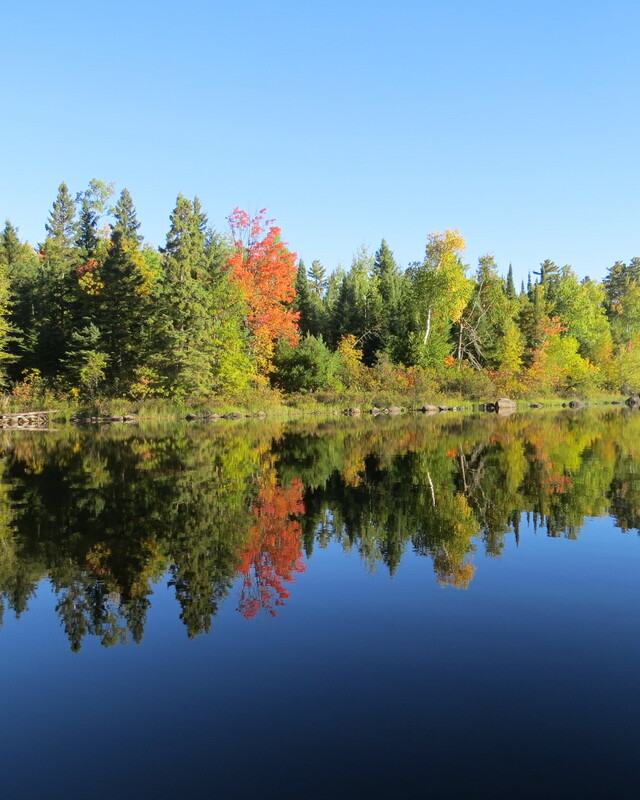 On a ten to twenty yard wide isthmus was everything we needed to explore two big bays of Basswood Lake, which straddles the US-Canada border for 14 miles, 27,000 acres. It is an International Treasure shared by the two countries. Basswood Lake campsite author stayed at in 2013. 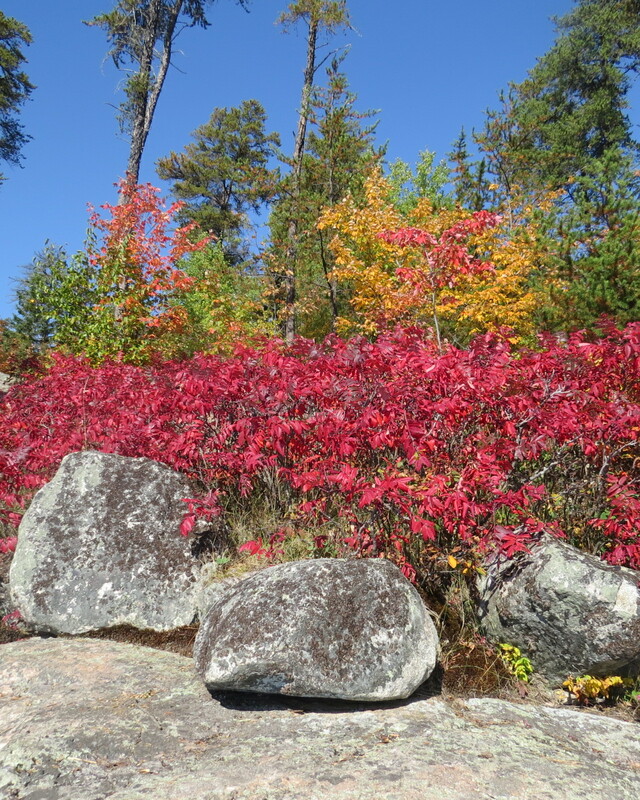 The Boundary Waters has designated campsites in order to restrict impact to certain areas. I have been on over 600 sites when I volunteered for the Forest Service from 1992-1999, cleaning them of trash and litter, sawing limbs of dead trees that were either a threat to a tent or blocked access to parts of the site. 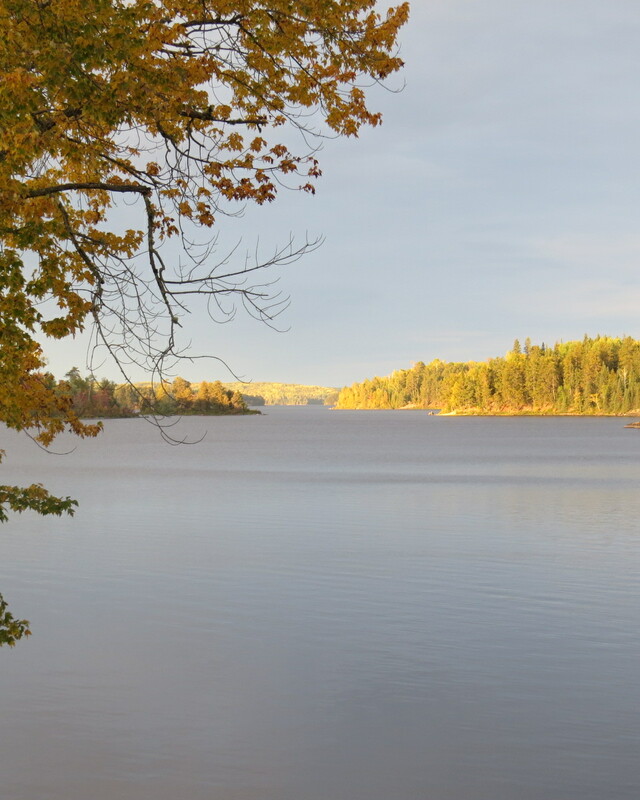 I have camped on more than 70 different lakes; on Basswood alone, I have camped on 20 different sites. 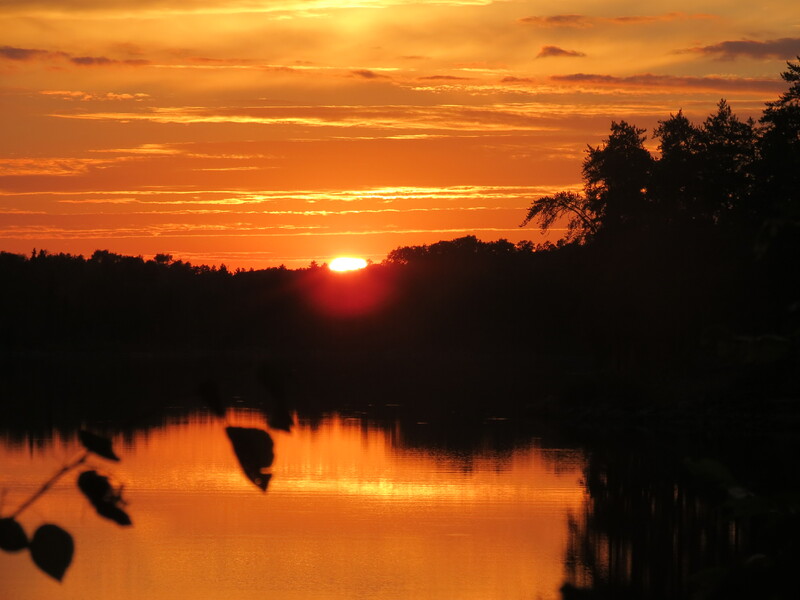 I like campsites on a point, with a great view of sunrise and sunset; a good place to land a canoe, a nice kitchen area; sheltered, if possible; and good, flat tent sites. The campsite we wanted had a view back up the bay. We had both seen it in 2012 and thought it adequate. We didn’t realize how lucky we were that the site was occupied. Sunset from the campsite, looking northeast. The aurora borealis, twice, because we had clear views to the north each night. The first night showed faint lime-green streamers along the horizon. 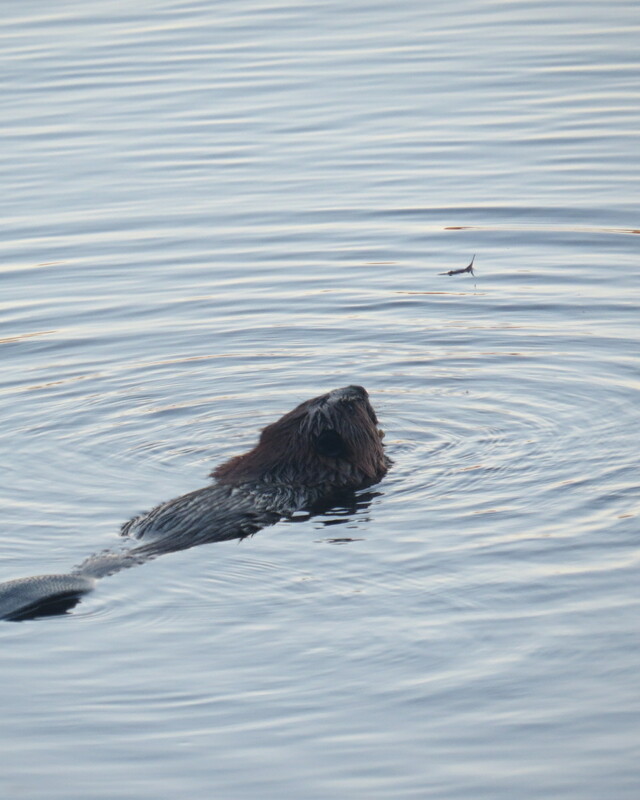 A beaver show nightly, when 2 adults and their young swam from their beaver house near the campsite into the nearby swamp. 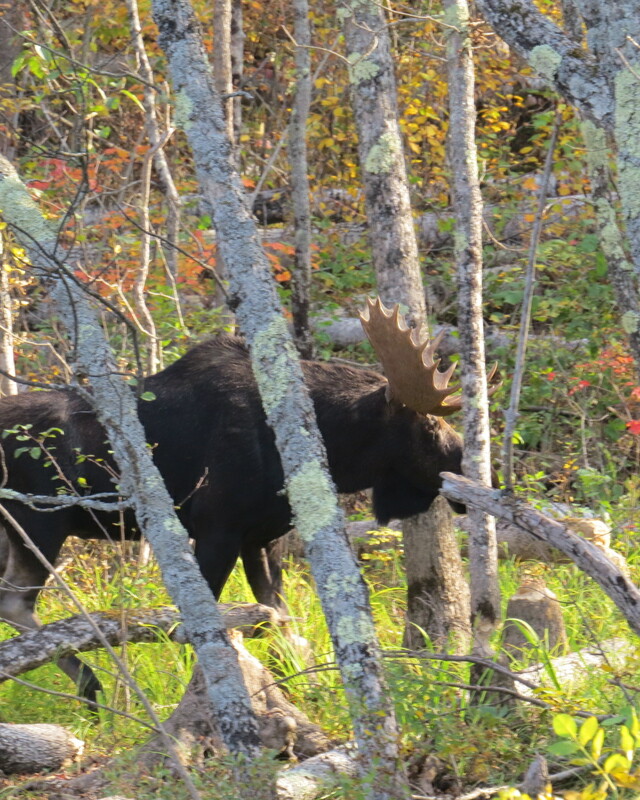 We saw them chewing trees, bringing logs and brush out, eating them not 50 feet away, then swimming back to their house. One of the best views I’ve had of the beaver’s tail. 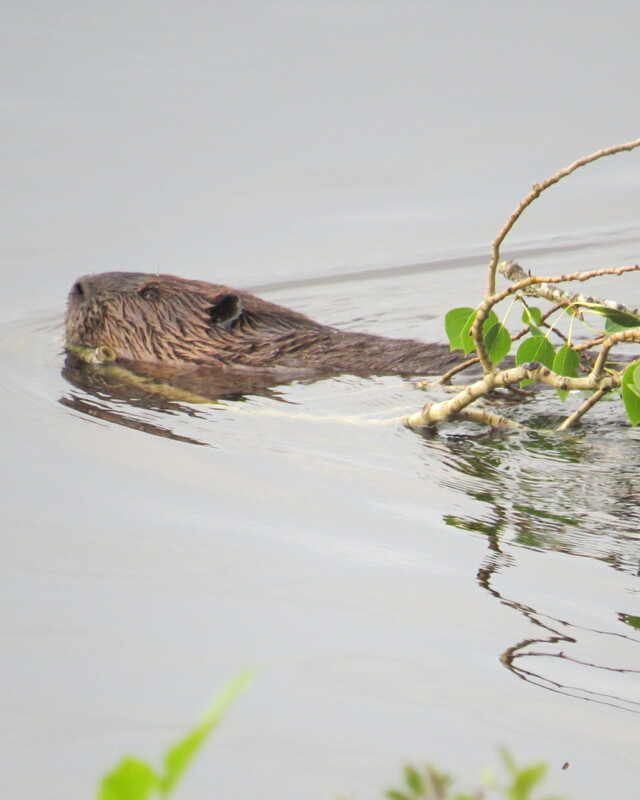 Adult beaver, who straddled the branch, and took it back to the beaver house. Once, one of the trees that had been chewed, cracked and fell, in plain view of the campsite. During one night, we heard a pack of wolves howl, a quarter mile away. 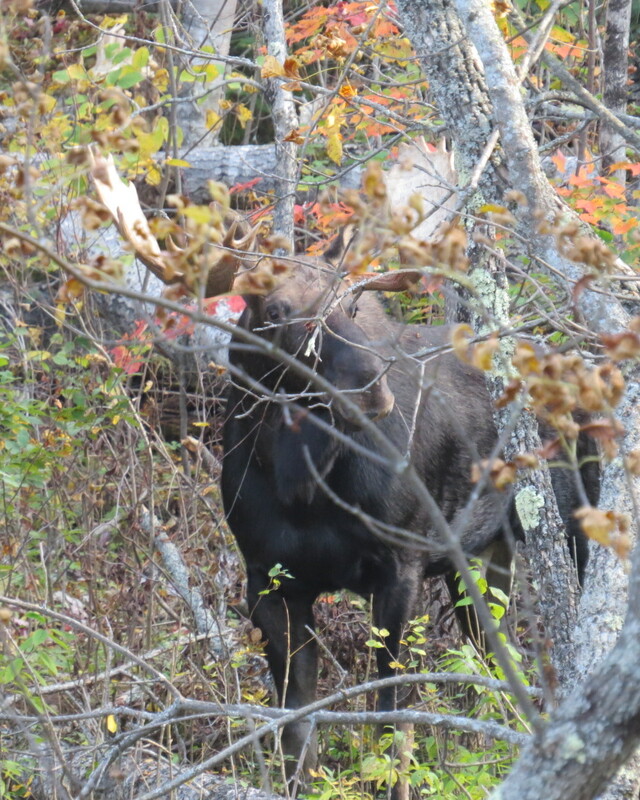 A large, bull moose came by the swamp, 50 yards away, walked along it in plain view, then walked through the back part of our campsite, without any evidence he cared we were there. 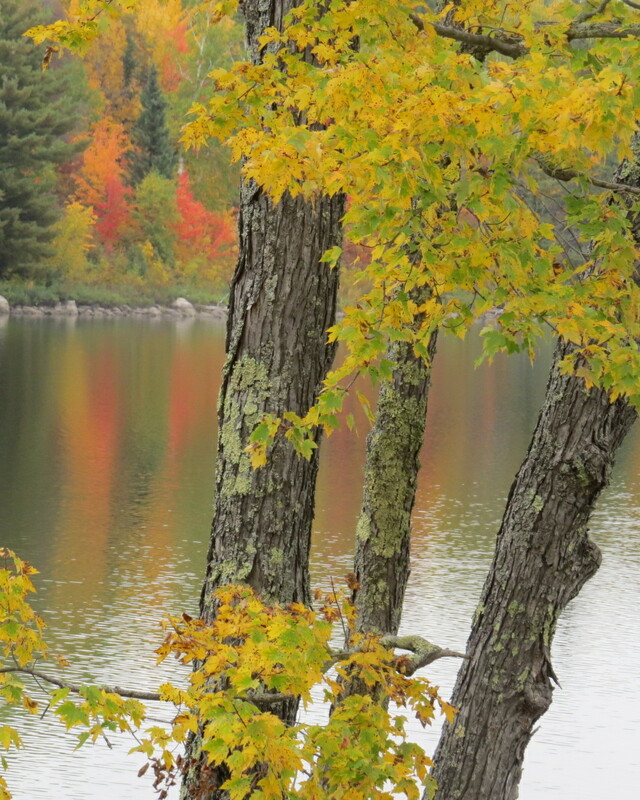 There were spectacular views of the autumn colors down the channel of Basswood Lake towards Canada. No more than five parties passed by the site daily. Sometimes, we saw only one. There were at least two days when nobody was on a campsite north of us all the way to Canada. Sunset view down the lake. 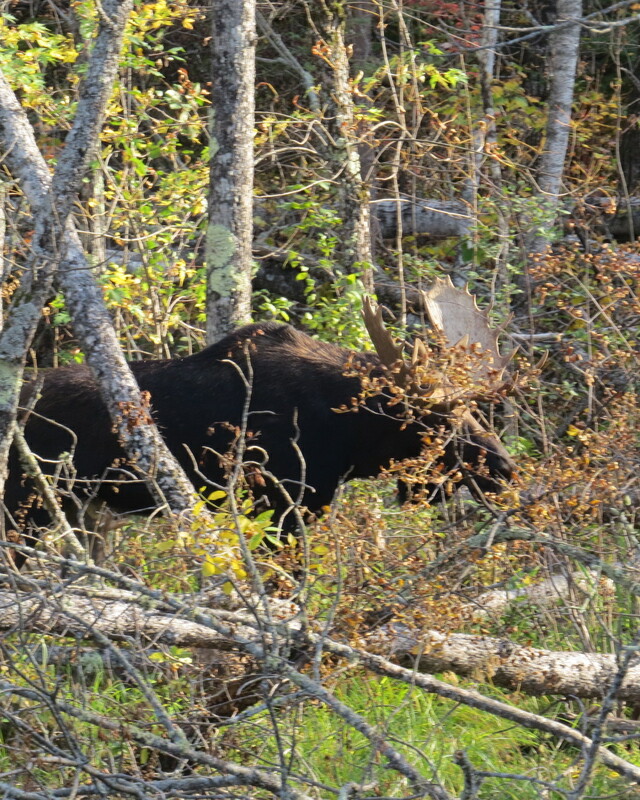 Bull moose arriving and walking through nearby swamp. In short, the site was a hidden gem. There are sites with better tent sites, good landings, nice kitchen areas, and good views of the sunset. There are also sites with poorer tent sites, difficult places to land the canoe, exposed kitchen areas, and difficult latrine trails to navigate. All we did was set up camp, stayed quiet, and looked. When one base camps, staying every night in the same place, one may travel a little each day to learn about the lake and have time to see what happens in a square mile of wilderness. I could have mentioned the eagle that flew overhead daily, the frequent visits of ravens, the loon often out front, the grouse nearby, the squirrels that ignored us, because they had never been fed on this site by people. There was also the gradual falling of leaves from trees that became quite noticeable, and climbing the cliff across the bay rewarded me with a nice view to the south. Twenty years ago, the idea of base camping didn’t appeal to my desire to cover miles and see new territory. With age, I have found that slowing down, camping in one spot and making it home for a few days appeals much more. It is easier, and I see things that I had missed on the 20 mile days. During this trip, we enjoyed the “outdoor triad” of wilderness, totally dark skies, and complete silence. Not only did we see the Aurorae, I saw Andromeda Galaxy and the Double Cluster in Perseus clearly, Capella’s and Venus’s reflection in the lake. Too many do not have the fortune to ever experience one of these 3; to experience all together is beyond measure. I have awakened in the Boundary Waters and seen Orion’s complete reflection in a calm lake, absolutely soundless, except the ringing in my ears, with knowledge nobody was within miles of me. These places still exist in America today. They need to be guarded, not allowed to be used to extract resources in the name of “jobs.” People who are alive today need these places, either to go to, like me, or to know only that they exist. Many who come here might return to the “outside world” differently, were they to do what we did. Is there a guarantee one will find a hidden gem? Yes. Being in the wilderness allows one to open his or her eyes and see the gems that are available for one who happens to be in the right place at the right time. It may be two leaves on the ground (picture), a bee or small gnats feeding on a flowering plant, or an ant carrying a pine needle twice as long as it is. Will one see specific creatures or sights? No, there is no guarantee. Yet, I had no thought I would see or hear the things mentioned above, except for the eagle and loon, which are common on all wilderness lakes in the North Country. The isthmus site is good and a beautiful place. 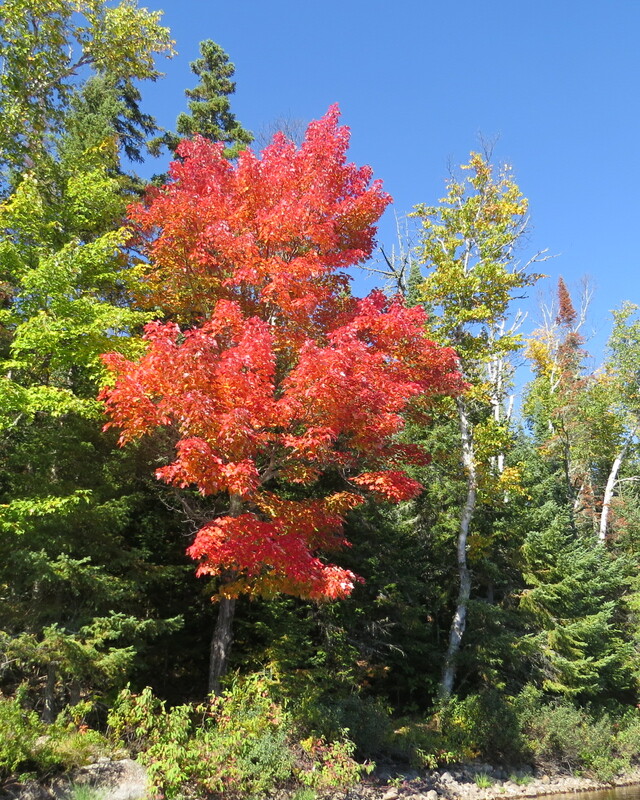 When we visited it on this trip, however, we saw a jackpine cracked in two, threatening to drop itself and at least one other tree into the kitchen area. That is a significant risk. The views there are great for sunrise and sunset. Last year, the sunsets were spectacular. But there are no views to the north, and there is no swamp nearby. I wouldn’t mind staying there again, for if I did, and were quiet, I would see something special. I just don’t know what. But I also know that there is a hidden gem nearby. Kitchen area above this color on another campsite. 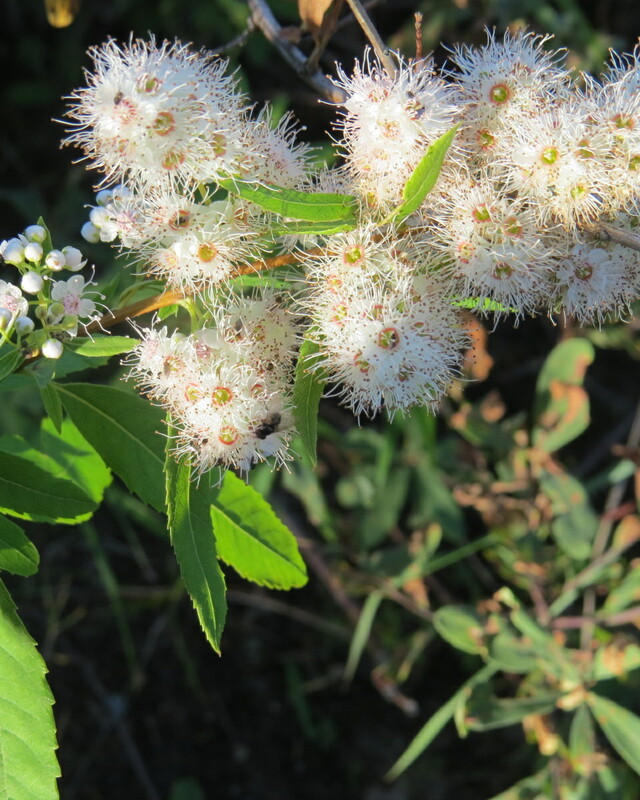 The plant that I spent time watching a honeybee pollinate and small gnats doing the same. 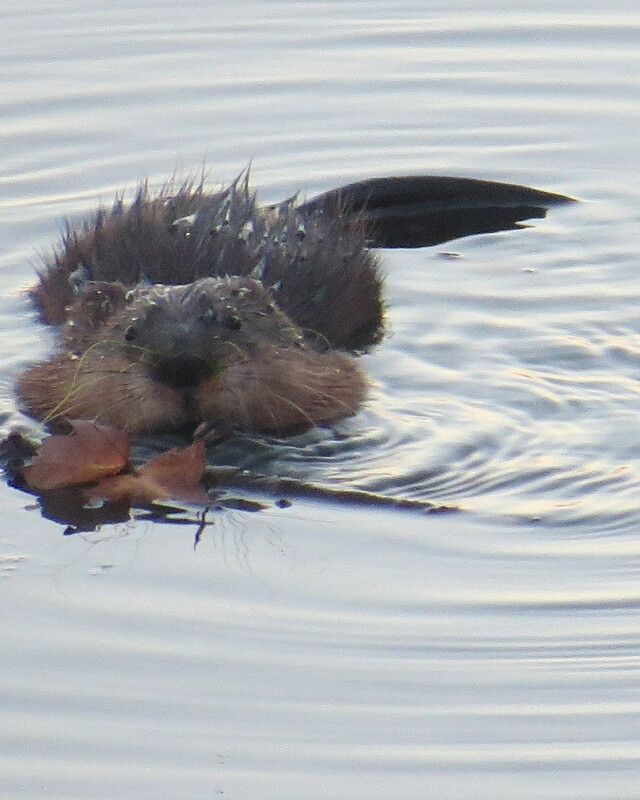 This entry was posted on October 1, 2014 at 18:50 and is filed under Uncategorized. You can follow any responses to this entry through the RSS 2.0 feed. You can leave a response, or trackback from your own site.